This vintage JR clutch was made in the USA. 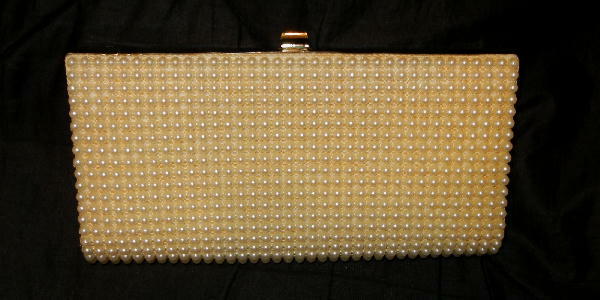 The exterior front, back, and bottom are covered in rows of cream color faux pearls on a sandy-cream lace background. It has a shiny gold-tone metal top and sides, which have some light surface scratches and some tarnishing. One of the top gold-tone frames has some slight dents. It also has a top closure and the interior fabric is in a dark champagne color. 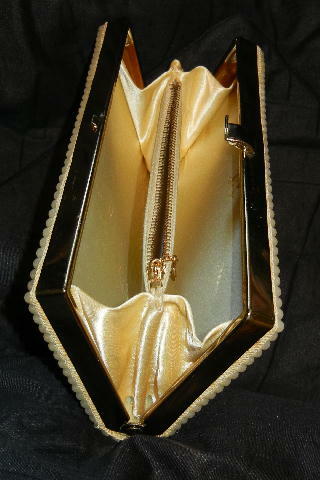 The interior section has a top zipper closure and gold-tone chain and loop pull. The interior lining has some pink makeup line marks on the side opposite the gold-tone JR USA. It's from a former French model.